Hello out there, it always feels strange to write "hope you had a good weekend" when I am on mine! Yesterday I had an all day work event, but despite that Martin put a few good hours into the bathroom, and I plan to put a few more in today. Slowly but surely we are getting there. Last we left off we had started with the subway tiles in the shower. After a full days work we had completed one whole wall (minus the trim) and 2 partial walls. 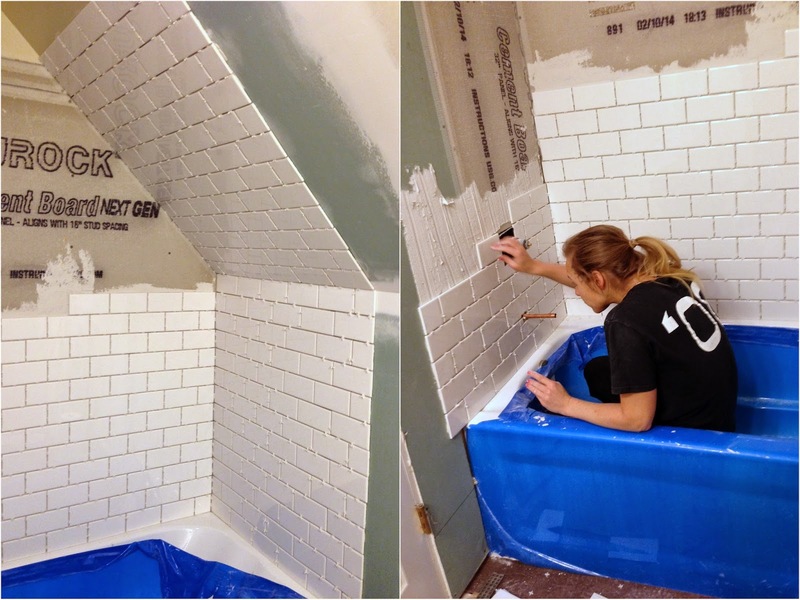 These subway tiles are definitely taking a lot longer than anticipated to go in. Of course in my mind I was picturing us whipping out the shower tile and floor tile in one day, yeah sure. At least I was ambitious! Yesterday Martin completed 2 full walls, leaving one a little of the third for me to wrap up. We decided to use an edger tile around the outside since we weren't going to be tiling to the edges of the wall to give it a more finished look. The edger pieces are like the frame on a picture. It really help to tie everything together. Up close some of our spacing is a little funky, but the good news is it dosen't really show in pictures. I'm hoping once the grout goes in it won't be too noticeable. The smaller the tile, the more there are, the more room their is for user error! Considering that I'm glad it looks as good as it does! You can see there are a few slivers that need to be filled in on the top left. It is no surprise in this house that the walls aren't level, we run into that in most projects. Our house isn't that old, but it's old enough. Considering, I'm surprised it wasn't off kilter more than it was. The remaining portion. I know better than to say, "This is all we have left!" because even though it appears the be a small surface area, this wall has been the wonkiest. I know that all those tiles need to be cut to fit so to keep a straight line up the wall. Wish me luck today, I hope to have good progress to report!